Tonight I found a lens of mine that needed some love. It’s not a money-maker, but it ranks well, gets decent traffic so I figured let’s see what I can do with it to make it rank better, get more traffic, and maybe see if I can’t turn it into a money-maker (which probably will NOT happen now that I am about to spill everything here on my blog…sigh). I have this lens about worm composting. I made it in February of 2008 and hadn’t touched it since April of 2008 (yes, I have not “freshened” the lens in almost 17 MONTHS). This is why I am always all about telling my One Week Marketing followers to get their lenses out there and simmering. Once a lens ages and gains some Page Rank of it’s own, it has real power and it becomes a resource that you can leverage. Sooooo…how has this lens been doing in all this time being left alone? BUT, it can be better. Not too bad. I know there are more keyword phrases I can work for now that the lens is older and more established. Upon examining this, I see that I rank #1 for how to start a worm farm, but I am about #4 for how to make a worm farm. I wonder which phrase is better… Could changing one word make a big difference in search volume? Well dang! Changing just one word in that phrase could mean four times more traffic if I rank #1 for it! I’ve read in a few places that a #1 ranking in Google means that you could count on about 40% of the search traffic, but for me, it never works out that way. Seems 20% of the exact search volume is more like it for my lenses and other web pages so I stick with that number when I am “guess-timating” potential Google traffic. Yup, that’s about right. I rank #1 in Google for that phrase and got 98 visits in the last month for that search phrase. Based on that, if I could increase that Google ranking for how to make a worm farm to #1, I could guess-timate that I could potentially get 20% of THAT search volume which would be about 320 visits a month. To me, this is worth looking in to! A nice boost in traffic would be sweet! I also decided that it was time to work this lens for a bigger and more competitive keyword search phrase. It’s well-established, sits on an authority site so why not? After poking around a bit, I came up with worm composting. 8100 searches a month… Yup, that’s what I’m talking about! I’d like 20% of that search volume, too! BUT – How Hard Will It Be To Rank? This is the BIG question. It is cool to pick keyword phrases you’d like to rank #1 for, but how hard will it be to get there? This is where experience comes in for internet marketers to help us identify when something is “do-able” or not…and how much work it will take to achieve that ranking. 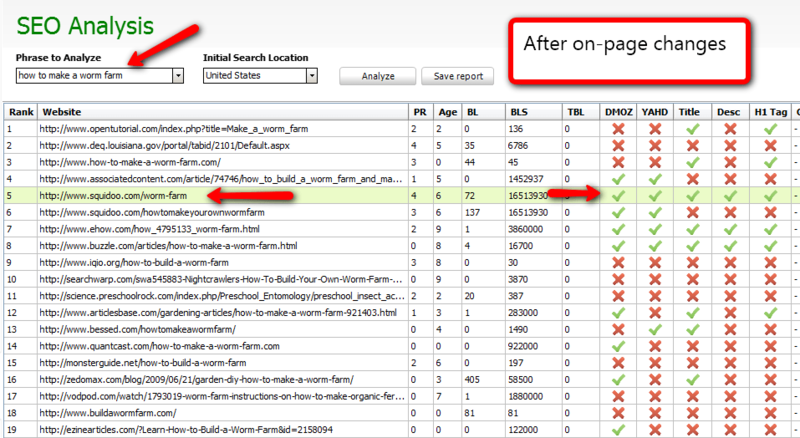 We stop looking as much at the results for a keyword phrase in quotes and look more at the sites we want to out-rank. This comes with time, experience, and some good tools. Starting out searching Google in quotes for the phrase competition is a great way to learn and to see yourself rank a web page. If you find keyword phrases that have less than 10,000 competing web pages in quotes, odds are good that you will be able to rank your web page IF you target that one keyword phrase and learn to optimize properly. This is not a part of your learning that you rush through. When you’re new and you try to optimize one web page for lots of keyword phrases out of the gate, odds are good that your web page will rank for nothing worth talking about…and you won’t see results…and you’ll give up. Start at the beginning and learn to do it properly. Then, the sky is the limit! The great thing about using Squidoo is that most of the work for on-page optimization is done for you… and the part you need to know I am about to share with you here in this case study. So, I wanted to know how hard it would be for me to get my lens to rank #1 for how to make a worm farm. I used another tool I have to check out what it going in in the query space in Google. Highlighted in green you can see my worm farm lens. What I am looking for are opportunities to optimize my web page for this keyword phrase and do it better than those above me. Things that have a green check mean yes, that page has that – a red x means no, that page does not have that. Now, one of the cool things about a Squidoo web page is that the Squidoo.com site is already listed in the DMoz directory and the Yahoo directory. How much this really affects ranking, no one knows for sure – but this is a factor that most SEO analysis programs will look at. Also, there are a LOT of back links to the Squidoo.com site, so all I really need to work on are links to MY page on the Squidoo site. Remember, web pages are ranked individually in Google based on their own strength. What site the page sits on has it’s benefits tho – especially when the web page is new. What I am seeing from this analysis is that I need my keyword phrase in my title, my H1 tag, and in my description. Then, all that is left is building links TO my lens with my target keyword phrase in the anchor text (the clickable words in a link). My lens already has a nice Page Rank 4 – which is because I built links to my lens and have links to my lens on the Squidoo site…and let it “simmer”. Based on the Page Rank of the web pages that currently rank higher than I do, Page Rank is not a problem for me here. Main thing I am looking at is Back Links to the web page of the ones that rank above me. Can I beat that? Without going too in-depth into back link analysis, the answer for me is yes, I can beat that. What About My “Bigger” Keyword Phrase? Then, I took a look at my bigger and higher volume keyword phrase that I’d like to start targeting. How tough will THIS be (especially since I don’t rank in the top 20 in Google at this time)? Hmmm… this one will be tougher. 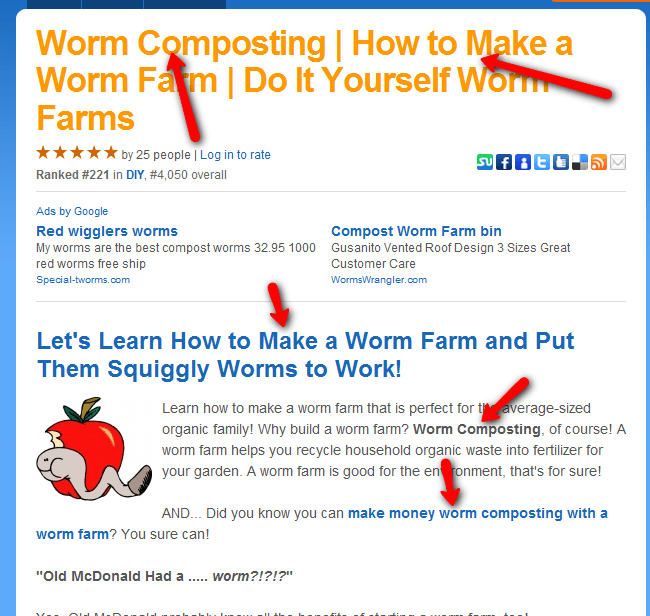 I did take a look at the back links for the web page that is currently #1 and there aren’t many (maybe one or two) links to the site with the anchor text of worm composting. I also noticed that a lot of links show because they have a few sidebar links on blogs. This means that every page of the blog links to the site and will show like a lot of links. So, based on that, and on the potential rise in traffic, and based on my sheer stubbornness and my love of a challenge, I’ll give it a try. Optimizing Your Web Page For Better Google Rankings. We talked about what I need to do ON my lens to help with the on-page ranking factors. I need my targeted keyword phrase in the title, the H1 tag, and in the description. Squidoo makes this VERY easy. The title you give your lens is also used as the H1 tag for the lens as well as what is put in the tag for your lens. If you right click on a lens, then choose “view source” you can see the code that Google reads. So, a good title, a good opening sentence or two in your intro module, and some good tags can really, really, reallllllllllly help the Google ranking of your lens when it is mixed with good back links TO your lens. So, I went in and changed my lens up. 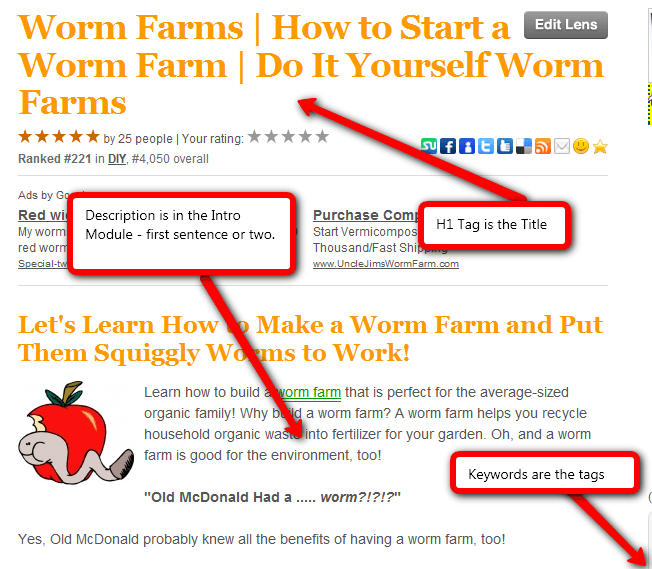 I got my two targeted keyword phrases in the title, in the intro module and in the tags. I also used a modified version of the keyword in an anchor text link. I think that Google puts a little more weight on words it finds as a link on a web page so I do this on my web pages. So, wonder how that made the SEO analysis of my web page look now that I made these changes? Green checks, all the way across – perfect! Next, I will take a little bit of time making some links TO my lens with links like how to make a worm farm and worm composting. After that, I leave it alone. Google will need to “read” the changes on my lens and they will need to find the new back links. It takes time for all this to happen and for it all to work together so I let it simmer and work on something else. If this was a One Week Marketing campaign, I would print out my Mind Map and write the one keyword that each part is individually targeting and be sure to link TO that page with that keyword I wrote down for it or for that phrase with a modifier. As you can see, the phrase I am targeting is still exactly in order in all of those phrases, but I added words to it so Google doesn’t find ALL the same anchor text for ALL my links. Make sense? People ask me all the time what is the best way to keep track of your One Week Marketing campaigns. For me, it is by simply printing out a Mind Map for each one and writing my campaign details on it. Log ins, keywords for each web page, urls… the whole thing. You can keep track of your rankings over time on the back. With the help from the tools I used here, you can also print out some reports to keep with your Mind Map so you have everything together. When it comes time to take your One Week Marketing campaign to the next level (ie, start using more than free sites to make money online), you can simply pull out your file and know where everything is when you get ready to make a niche website. There you have it – inside my little pea brain. What I’ve shown here will work with any web page – not just a Squidoo lens. Thing is, Squidoo makes it easy for this to work, but once you ‘get it’ you will be able to apply this to getting any web page to rank higher in Google. I used the Google Keyword Tool. I always switch it to show me the “exact” search volume. I feel this is more accurate that the default “broad” results. I used this software for the SEO Analysis. This software is really cool and does lots of great stuff – and, it’s FREE. Now, the paid upgrade is awesome and enables you to do so much more, but you don’t have to pay for anything to have the basics of this multi-purpose SEO tool. I used this tool to see what my web page ALREADY ranks for. To me, this is one of the best tools I have. Being able to enter a url of a web page I own and see all the phrases my page ranks for is so great. And, for reverse engineering a niche or a web page that is ranking higher than you, being able to enter THEIR url and see what THEY rank for is absolutely PRICELESS. Here is an example report you can look at to see all this program can show you. If you have used Squidoo and are wanting to take your earnings to the next level, take a look at my One Week Marketing Action plan here. Hope this info sheds some light on how you can improve the Google ranking of your Squidoo lens or web pages. Guess this post coulda been an ebook because it is SO long and SO in-depth, but hey, why not put it here on PotPieGirl.com so everyone can see it and learn from it? Any questions? Post them here in the comments area please. I’ll be out of town this weekend, but will try and answer and moderate comments as soon as I can. If you liked this post or found it useful, please feel free to “tweet” about it or link to it. It would be greatly appreciated! Thanks for such a wonderful tutorial on how to improve page rankings. You never cease to amaze me with your willingness to help others. That is why you have prospered so much. Your posts are like a blueprint to me. You are indeed a wonderful human being. I can go on and on. Thanks again. Curses, now everyone will know of the lucrative worm farming niche!!! I love the worm composting lens. I’ve been toying with the idea of worm farming for a long time. There is definitely a lot of money to be made. Who would have thought you can get rich selling worms and their poop? I live on a lake and the last person who sold fishing worms around here quit years ago. Sigh, so many opportunities,so little time. It never ceases to amaze me how much solid,instantly usable information that you just GIVE away on this blog. Keywords were such a stumbling block for me until I discovered PotPieGirl.com. Even though I’m not a total newbie anymore I still manage to learn something new from each of your posts. Glad that you got this post back and didn’t lose all that hard work. I almost was going to ask the same about worms and then looked at your lens… brilliant! Thank you for this brilliantly concise and clear description/tutorial! I do hope that you will follow it up in a week or so with a report (and assessment) on how you check how well your tweaking worked. I’d also be fascinated to know what is the ‘life-cycle’ of a typical project – I’m quite sure that no project is really typical, LOL, but I hope you understand what I mean! Perhaps aggregate time-line stats for a bunch of projects would be useful (if it can be done). Hi there! I was referred to your blog by a friend on twitter. Very awesome information here. Thank you so much for the info – not that I completely understand all of it!! I’ve just started my first “OWM” campaign, got Two Lenses up, but in my case it will probably be a Two Week campaign or more! There seems a lot to do!!!! I do love your “OWM” guide – it’s brilliant – I feel sorry for any Newbie who hasn’t found it yet!!!! @ Tyla – Thank you! Funny, but I found the worm keyword by simply poking around in a keyword tool. When I came up on ‘worm farm’ I had NO CLUE what it was! So – it was a learning experience for me, too. @ Karl – Yep, glad that’s all that was MIA after my incident, too. I’ll be writing a post about my blog being hacked soon. @ Andrew – I’m planning on doing a follow up report after awhile. I think it will be good for all of us – myself included. Let me know and I’ll do the best I can to answer. @ Pat – Welcome to my humble little piece of the internet! So glad you’re here! @ StevieP – I know a lot of it might be a big pile of mumbo-jumbo right now…. but believe me, in time, it will be like a lightbulb exploding over your head. Yes another great article by PotPieGirl. No doubt his is one of the website which I will recommends to my readers of my blog or friends who wish to learn more about Squidoo. Thanks for your response! I’m sure many will be fascinated to see what effect your tweaking has on this lens. By ‘life-cycle’, I mean the stats for hits, conversions (and overall profitability) of a project over time. I’m well aware, of course, that some projects will be very profitable, others will just tick along and (hopefully) a few may be a waste of space. 1) I would expect most of them, however, to have a common shape to the graph of hits per day/week. It’s the shape of the graph that I was interested in (rather than actual figures, which will vary, of course). Is it of the quick rise and long tailed decline type or does it slowly rise to a maximum and then enjoy an indefinite ride at about that level? 2) In your experience, are conversion rates (sales) a fairly constant percentage or are they related to the price of the article (e.g. the higher the price, the lower the percentage), the type of market or, perhaps, something else … and what conclusions might one draw about what is a more profitable market (in terms of the effort involved in setting up a project)? I hope these questions don’t seem too impertinent (or too wooly). As I say, I’m interested in trends rather than specific cases. Perhaps you aren’t in a position to answer them adequately (through lack of data or lack of time or because of the complexity of the way you set up links and back links) , in which case, I would completely understand! Very interesting post and look forward to the follow-up. May I ask where do you get such great images? Love the worms! And do you find text links to Amazon more effective than say an image link with the price showing? Can you maybe tell where you get your personal visiting stats and such from? O did you answer that and I missed it. Thanks for all the really great training. Maybe I’ll make something profitable yet and it will be greatly because of you. Is there any way you can specify the ALT tags on images you use in your Squidoo lenses? 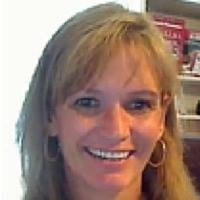 hi jennifer i just wanted to say that the squidoo christmas cash pdf is an awesume read the information is soo good she should have charged for it! You take care and well done to the producer of that ebook! Awesome case-study! Thanks for posting it! I like how you go into detail with screenshots! Thanks! Great article about boosting search engine rank. Did you actually change the name of the original lens? How do you get links for your site? Thanks Jeniffer for yet another great post! One slight problem with SemRush the free version I am using, none of my lens data comes up when I do a search. Instead it gives me the default squidoo.com results. I did do a search on your worm farm lens, and the relevant data came up. Do you know why this is happening? The guys at SemRush don’t seem to know either. Wow Jennifer, thank you so much for taking the extra time to do this. This is excellent, valuable information, and just the kind of thing that I never seem to get the time to get around to doing or figuring out myself. You’ve laid it all out so nicely and simply (including the tools you use), there’s no excuse for any of us to not take these steps to improve our ranking. We have a worm farm by the way. It’s been going for years, started when we were renting a tiny apartment, and now we are living on our own 2 acre lifestyle block, complete with organic garden and new orchard… the worms are right at home. They have to compete with the chickens for kitchen scraps now though 🙂 but they’ll be getting lots of grass clippings now that we’ve started on the orchard. I’m going to click on over and read your lens now – that’s just an incredible bonus! Thank you again, you are really the BEST! Great post! I’m especially appreciative of just how much detail you go into in order to boost your search engine rankings. A lot of people leave some important steps out, but you can’t ask for more than this. Thanks for sharing with the rest of us! Fantastic post! Thank you! . . . Do you have a suggestion for another SEO Tool? The one you said you used does not offer a Mac version and we don’t have any PCs. I second Everlie’s question, I’m on a Mac too – would love to know of other SEO tools if the ones recommended are PC-only. I was aware of the potential of the Squidoo lenses but I never gave it a thought that an inactive lens can also gather traffic. This is something new for me. I believe that while drafting my new lens I will make the full use of these informations. And your SEO Analysis tool is really awesome. You obviously have had much better luck with squidoo. I gave up on it. I built a ton of links and even got it up in the internal rankings. I was in the top 100 and still got little to know traffic. Even to this day with tons of links to the page it gets maybe 2 visitors a week. Keyword was fairly competitive but I worked hard on link building and SEO and got nothing out of it. Oh well off to bigger and better things. I’m having much more luck with article marketing and and my own sites. Yes, some people just have a very difficult time ranking squidoo. The most crucial aspect seems to be the title. It’s like trying to purchase relevant domain names right at the introduction of a new product launch. I was told by a successful SEO guru that Squidoo is too much work for the results. I guess I will have to give it a whirl and find out for myself. would expect most of them, however, to have a common shape to the graph of hits per day/week. It’s the shape of the graph that I was interested in (rather than actual figures, which will vary, of course). Is it of the quick rise and long tailed decline type or does it slowly rise to a maximum and then enjoy an indefinite ride at about that level? Hey, thank you very much for this entry. Thank you so much this was extremely helpful! We need more tips like this!